German researchers discovered an intriguing connection between electricity and obesity. Please, after reading this, don’t hook a 9 volt battery to your head. It is a bit more complicated. Researchers from Lübeck in Germany took a group of volunteers and for eight days stimulated their brains’ dorsolateral prefrontal cortex with electricity. That region of the brain plays an important role in regulating appetite and eating. 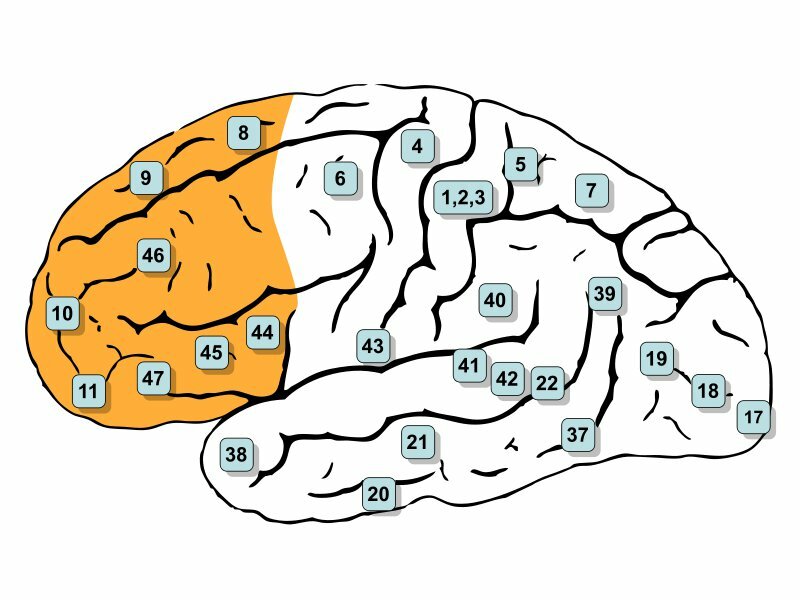 The prefrontal cortex (orange) and its dorsolateral region (8, 9, 46). A second group only got a mock set up (the electricity is so low you can’t tell if current flows) and afterwards both groups got free reign over a buffet. The guys who got the real electric stimulation ate 14% less and also reported reduced appetite. I can only guess how those researchers got the idea to try this. Seriously, if it helps people lose weight as much as the more boring traditional way remains to be seen, as the test subjects were of normal weight. The researchers need to repeat the whole setup with obese people and check if it influences their weight. Looking at the trajectory of the poor sod’s gum, Dr. Venkman failed at researching ESP, but may have been at the cutting edge of obesity research! Pictures courtesy of Thomas Bresson and Wikimedia. I wonder about the effects of using electromagnetic energy?